How Often Can You Repeat Your Outfits at Work Without Seeming Crazy? How Often Can You Repeat Your Outfits at Work? 2018 Update: We still think this is a great discussion on the important topic of how often can you repeat your outfits at work — but you may also want to check out our more recent discussion on repeating outfits at work. If you’re wondering how to mix up your outfits more, check out our work outfit challenge, with TONS of work outfit ideas! Do you have any tips about how often you can wear the same outfit to work? Or posts on outfit frequency? I tried to search in the archives but couldn’t find anything. This is a great question, and one we haven’t talked about before. A friend of mine was just describing a former coworker who wore the exact same outfit (dress, tights, shoes, jewelry) multiple days in a row — and how no one could figure out what her deal was (but everyone was wondering!). So: don’t be that coworker! To me, “once every two weeks” is about the max you can get away with for an clothing-specific outfit. Thinking back, some of my favorite work outfits that I might have worn up to twice a month would include things like the blue blazer/gray pants/pink blouse combo above… or olive green pants, olive cardigan, purple tank…. or black skirt, bright blue cardigan, burgundy red tank. On the other hand, very memorable pieces of clothing that I have (a hot pink skirt with a white diamond pattern on jacquard fabric, a floral green blazer) are things that I would only trot out a few times a quarter because the piece of clothing *was* the outfit, if that makes sense. This doesn’t mean that those hot pink skirts aren’t worth the money (particularly since one skirt may stay in your closet for 5-10 years) but it does mean that you should probably limit those memorable pieces (and make them good quality, so they can stand the test of time) if you’re updating your professional wardrobe, just beginning to build your wardrobe, or you have to whittle your wardrobe down to basics because you’re traveling for work. Readers, do you put together entire “outfits” and rewear them? How often do you rewear outfits? At what point do you begin to wonder about colleagues who repeat the exact same outfit? How often CAN you repeat your outfits at work? This is a joke, right? I think if Michelle Obama and Kate Middleton can repeat their outfits, then certainly a bunch of working women, with real lives, can repeat outfits. Not every day of course, and certainly the more memorable the outfit, the longer you need to wait to wear it again. But seriously, who could possibly have enough work appropriate clothes that they would never need to repeat the exact same outfit? I think people are unlikely to notice these things unless it is every single day. Think about one of your coworkers? Can you name what they’ve worn this week? People are always way more focused on their own lives than they are on yours. *I may be saying this to justify the fact that I’ve worn a red skirt 4 times in the past two weeks. But they were different contexts and it makes my legs look amazing. I think like Kat points out, it depends how you define “outfit”. I wouldn’t wear the navy blazer, pink blouse, and grey trousers with the same exact jewelry and shoes the following week. But maybe I love the shoes and pants together, so I swap in a green blouse instead for week 3. If changing out the accessories/one piece makes it a “new outfit”, then I might only repeat the same outfit once or twice a year. I agree with Gus, but isnt GUS a man’s name? I think there was a talkeing horse on TV named GUS, right? Unless the name is short for GUSSIE, that is. I try to wear VERY conserveative outfit’s at work so that they are NOT to noticeabel. The onley thing specially noticeabel is my shoe’s which are VERY styleaish and therefore the manageing partner and Frank are abel to stare at them (and my leg’s when I wear them). I do not care, b/c I do alot of walkeing lately with my FITBIT and am loooseing weight. YAY!!!!!! But to answer the question, I think you CAN wear the same thing to work as long as you dry clean them regularly, particulearly SWETER’S. I knew a woman from Germany who ALWAYS wore the same sweters in College and she NEVER dry cleaned them. They SMELLED BAD b/c she did NOT wear deeoderant either, so soon after she put them on, they began to smell like her BODY ODOR. Even tho she was very cute, she did NOT have a boyfreind, and I am pretty sure it was because of the SMELL. FOOEY!!!! Sorry to be rude but don’t you have spell check on your computer or iPad? She’s saying how *often* can you repeat, not whether you can repeat at all. Michelle Obama wears the same shirt like twice in a year (on just a regular day, not to a big event or anything), and the media is all, “Oh she shops her closet! !” That irritates me. I agree that Kat’s conclusion is that it is ok to repeat, just not too often. But even needing to ask the question suggests that there might be some debate over whether repeating is ok. They do this with other people too, so I don’t mean to say anything negative about MO at all. It’s really the implication that it’s a miracle that someone wears the SAME WHITE T-SHIRT twice rather than buying a new one every time – oh. my. gosh. For example, I used to work in a developing market where my coworkers usually wore the same outfit several days in a row, if not all week (aside from the very trendy, who understood they should rotate, but would still rotate the same pieces on approx. a 3-day cycle). And yes, I noticed, because it’s weird to an American. To be fair, they marveled at how I had “new” outfits for every day. My wardrobe wasn’t extensive, I just dressed to not repeat the same outfit twice in 1 week (though I did often repeat some components). It’s rather strange, you don’t think you’d notice someone rewearing their clothes, until it happens in your environment. Then by day 4, you’re slightly grossed out. They probably didn’t have very many clothes. Truth. I defintely knew that before I went into the market, though I think most of my coworkers (professional level) did have enough in their wardrobe to rotate more often. Another reason they probably didn’t change their clothes as frequently is that they also don’t wash their clothes as often, because the washers available in that country are really harsh on clothes and most people don’t have dryers at home. To be fair, most people managed not to be smelly. Not sure how, perhaps something in their biology. Great question. I have a dear colleague who is so sweet and great, but she wears extremely memorable outfits over and over again – she has a very recognizable, dated suit that she wears once a week, as well as a dress that is very distinct, also once a week. People have definitely commented on it because her clothes stand out so much. On the other hand, if someone is wearing black pants and a neutral color blouse, I probably would not notice the repetition as much. Timely post — due to the freezing temperatures and the fact that I was out of the office most of the day yesterday, and I don’t actually think anyone in my office saw me with my coat off, I woke up this morning and decided to wear my most cozy, warm and work appropriate cashmere sweater. Which happens to be the same most cozy, warm and work appropriate cashmere sweater that I wore yesterday! +1, except for me, it’s an enormous drapey wrap style sweater that I’m wearing over a different shirt. I think that it would be reasonable for me to wear the same jacket over a different shirt so the same rule should apply to cardigan style sweaters. Hope you’re staying warm and cozy! Realtalk: if I switch up my jewelry, I can wear the same black dress five days in a row and nobody even notices. Right? You totally could. I kind of love the idea of a uniform of perfectly tailored but pretty much identical dresses. Monday – original dress in black. Tuesday – original dress in purple. Wednesday – original dress in black & white print. Thursday – original dress in blue & white print. Friday – original dress in burgandy. Sigh. Tell me the truth – are you a plant from Nordstrom’s? Because I think I want all of these. I guess this reader question raises a whole other question to me: Can you wear too many outfits to work? For example, I do shop quite a bit (quality, usually not too flashy pieces) and I love, love, love creating new outfits out of what I have in my closet (I also once didn’t shop for a year and recycled my wardrobe in 365 different ways). In the office, do you think people notice if a person constantly wears new and different clothes and/or combinations and comment negatively on that: too much money, too much free time, too vain, too focused on fashion …. yade yade yade ??? I don’t think someone would be negative at all. One black dress (well, one design, there were multiples for laundering purposes) worn for 365 days. I’m not sure that’s true in my office. People would definitely notice. I guess it depends on the crowd. I wear the same black dress every week. I make sure I’m not wearing the same jacket/cardigan/jewelry as I was wearing last week, and bam that’s one work day down. I have two identical dresses, so I’n not doing laundry every week. Outfits are repeated a lot in my casual office, and no one really cares. I like repeating my favorite outfits, and I’ll wear a combination that makes me feel very confident on a day I’ know will be stressful. Add a pair of black pants and a black pencil skirt with a rotating cast of tops and you’ve got most of the week! During the winter, especially right now when it’s so frigid, I’ve been living in slacks (with tights underneath), sweater, and boots. I haven’t worn the exact same slack/sweater yet this week, but pretty much have worn the same genre. It gets boring, but it’s too cold to wear a skirt and too cold to wear just a blouse so I’m stuck. I’m hoping I’m not the sweater and slacks girl…. Have you tried mixing colorful blouses under your sweaters? That way you are extra warm and have a pop of color that differentiates the outfit and the neckline is also broken up – tie neck blouses vs. collared blouses in particular. I’ve also used scarves and brooches a lot more this week to differentiate my outfits than at any other point this year. I’ve also tried wearing printed silk shirts with crew necks and crazy prints underneath my V-neck sweaters for a pop of color/print. I am also a fan of the mix and match wardrobe. I can get 24 outfits from three pencil skirts, two cardigans, and four black & white patterned tops. Capitol Hill Style has had good posts on mixing and matching outfits for the spring over the last couple of days. Boardroom Belles has a 9 2 5 feature every week, in which they turn 9 pieces into 5 different outfits. Sometimes their stuff is a bit off the mark – you wouldn’t catch me dead in that kind of color-blocking, but generally it’s a pretty good exercise and at least 2-3 of the outfits are wearable. If I had all the money in the world, I would probably still wear my ten favorite things – I would maybe just find different places to wear them. I am also new to an entry level position, and repeated clothes a lot within the first few months until I learned the work environment and was able to afford to go shopping for good pieces to refresh my outdated business wardrobe. I have multiple co-workers who repeat garments within the same week; and lots of colleagues who have pretty much a work “uniform” and wear slight variations on that all the time (ex. trousers and blouse). I also work with several consultants, who usually dress pretty conservative and stick to the “uniform” look, such as a white blouse and dark trousers. That said, I am probably still on about a two-week cycle, as I believe in fewer, better quality pieces. I do laundry every two weeks. Hence, the outfits cycle through at the same rate. This is me, too. I own four pairs of the Gap Perfect Trouser in black. Guess how many days of an average week I wear black trousers to work? :D And one other day is usually the Gap Perfect Trouser in grey. I like my work uniform. . . . I agree it’s fine to wear a similar look, but not the same exact outfit. I noticed a coworker wearing the same dress twice in one week. I didn’t think it was wrong per se, but I did notice. I would not wear the same party dress in the same company, except a few LBDs. Back when I was a poor student putting myself through school working in a business-cas finance department, I literally had three skirts and one pair of pants, and so I wore the same [email protected] thing every week. This was a top-ramen and tuna type budget. I varied the blazers and cardigans but I was very low budget. Now I know how to dress better for less but back then I had no clue. I hope people didn’t judge me. I do know people now who write charts and don’t wear the same combo more than once a month. I log all my outfits on my computer calendar. I’m a huge fan of the system. I can be sure I’m not wearing a certain item again too soon and helps me remember my better outfit combinations. It’s also nice to have outfits synced to actual events on my calendar so I can make sure that I don’t wear the same outfit with the same group of friends. Not that this would really be the end of the world but it takes 20 seconds to write it down so when I am planning to meet a certain friend I can mix it up from the last time I saw her. It also helps me keep track of which clothes I actually am and am not wearing. I just want you to know that I am in awe of people like you. 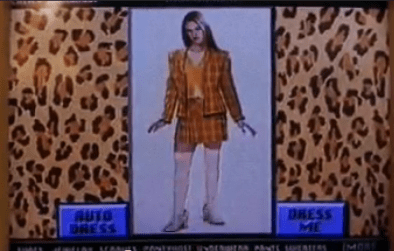 Please tell me your Outlook works like Cher’s computer where she picked out her outfits for school. I used to have an Excel Sheet with every single piece of clothing I owned sorted into different categories (short sleeve tops, long sleeve tops, pants, skirts etc.) and then plan outfits from the sheet. That particularly saves sooo much time and suitcase space when you are packing for trips. I would plan the outfits in the subway ride home and then just throw everything in the suitcase once I got there. Basically start with one outfit and then build the others from the pieces you’ve already virtually packed. Once I managed a 3 week trip on carry-on luggage without repeating an outfit (though I did launder 2x in between). I’ve since then expanded the Excel to include tabs on every trip and now when I am pressed for an outfit, I just try to remember when I had to wear something under similar conditions (weather, company, social function etc.) and look back over my trip tabs to find something appropriate. Admittedly, I’ve long since given up logging all my pieces because the in- and outflux is just too great, but I still do the Excel Pack. Three weeks ago, I went on a weekend trip and HADN’T planned the outfits beforehand. It took me nearly 40 minutes to pack and 10-15 minutes every day to dress, so DH begged me to make sure i use “the system” the next time cause he got so annoyed. I wish I could pack in 40 minutes. Woah. I thought this was a joke when I read it! However, this is all moot because there’s no way in hockey sticks I’m going to get myself to fill out charts in the morning when I can barely get myself to make breakfast. That’s why I do the calendar system; I tend to wear lots of bright, patterned, or otherwise more memorable outfits. Magenta The Skirt with cobalt jacket! White and navy tweed skirt with pink shell and navy cardigan! Bright purple sheath dress with tan jacket and leopard heels! It’d be super obvious if I repeated an outfit in a week. While I don’t log everything, I do take pictures of outfits I particularly love when I come up with them, so if I’m feeling uninspired in the morning I can flip through my phone and get ideas. But I think we could be office friends. I love my teal cardigan over a purple shell and plaid-ish skirt! Also, I have a navy tween skirt and I’m totally stealing your pink shell idea…normally i wear it with a white and blue top and a yellow cardigan (memorable, hello!) but you gave me new ideas! I recently found a royal blue skirt hidden in the back of my closet that I bought years ago, and I’m resisting the urge to wear it every week! Not that your system is not super impressive, but I have to say that for people who always dress a certain way — whether it’s all gray and black or lots of brights colors and patterns — it all blends together in my mind. The only people who wear something I remember are ones who wear something unusual for them. Anything “typical” just blends together. Agreed! If you do your work well and dress professionally, repeating garments should not be an issue. Nothing to add except: those outfits sound really cute! I definitely wrote my outfits down in my planner in high school so as not to repeat the same outfit more than once a month. Those were the days. And this is why I am glad I wore a uniform to high school. I have about ten pencil skirts, a few pairs of trousers, thirty button-front shirts and twenty V-neck cashmere sweaters which I rotate . Yes, I look almost the same every day. But I always look appropriate (even overdressed in Silicon Valley) and I don’t have any outfit angst, ever. I have “nicer” dresses or blouses for when I am at the printer or meeting clients, but mostly, this works fine. And, yes, I am that girl–I always look vaguely similar, yet presentable (and preppy). It works for me. In my defense, I buy all of it on sale–I know my sizes and my go-tos–Bloomies, Lands End, Lord & Taylor for cashmere, JCrew and Talbots for my pencil skirts (some of which are 5+ years old), and I always get my shirts at BB during their clearance sales. So yeah, boring. But no angst in the AM, ever. In my defense, it’s all bought on sale, often out-of season. I know my sizes and my go-to stores, and I never have AM outfit angst. And I never worry that if I’m pulled into a meeting I’ll look bad, either. KAT – I’m getting weird error messages and posting twice like an interwebs newbie?!? Help! this sounds like me. I’ve recently started following capsule dressing or project 333 (living with less clothes) where I’ve cleaned out my closet and saved only stuff that fits, can be matched with something else and are classic pieces. and getting dressed in the morning has never been easier and less stressful. It takes me no time at all now to find something to wear since most everything will go with everything else and I know where I have a hole in my closet (need twinset preferably cashmere and one additional suit) so I’m not inclined to just buy for the sake of buying. I wear mostly the same basic outfit every day-cardigan, blouse or shell, and neutral skirt or pants. But I never repeat exact combinations more than once every two weeks, and individual pieces don’t get worn more than once a week. I wouldn’t wear something leopard print more often than once or twice a month, e.g., but if we’re talking neutral pants and a sweater or black dress and tights I repeat that kind of outfit all the time, switching up the cardigan/scarf/jewelry. I rarely wear the same pieces in the same week, but…I’ll probably wear it the next week. Especially sweater dresses during the depths of Chicago winters, or my favorite skirts. And the black pencil skirt appears every week, of course, but I usually manage to pair it with different sweaters. I am that girl who wears all the purple, though. I’m the same way – nothing twice in the same week (except a pair of pants, maybe) but its fair game for the next week, including “memorable” pieces. It just depends on what is weather- and schedule-appropriate for the day. Also, some memorable pieces might get a lot of wear in certain seasons, but you won’t see it again until next year. No one else repeats basics? I definitely wear the same black wool trousers, often on back to back days, with different tops. I also have worn outfits on a weekly schedule, not because I don’t have lots of clothes, but because I get into a rut. I repeat ~3 pairs of pants for a 2-week period and then wash them. Begin anew with another 3-4 pairs of pants. I could wear a fresh set of trousers every day but why? oh yes, I’ll wear the same pair of pants several days in a row since they’re usually on the floor or draped on a chair and that’s easier than getting something out of the closet. Really should take better care of my work clothes, gah. I have no shame about repeating pants. I won’t wear the same pair two days in a row, but what’s the harm in wearing black or gray pants more than once? Most of the interest in my outfits comes from wearing colorful tops. Ditto. All of my pants are black or gray anyway (although I am wearing the one camel pair today). I definitely repeat the basics…no shame there! I have four different pairs of almost-identical black trousers that get rotated in and out. My basic uniform is black pants/a-line skirt, bright top (partial to teal and purple, although I’ve got a deep red sweater I LOVE at this time of year) and a black or grey cardigan. Not the most creative, but it works and for an entry-level position, it stretches the shopping dollar nicely. I rarely repeat the exact same outfit. I’ve built a work wardrobe in the last several years of basic, classic pants and tops that can be easily interchanged (pants and skirts in navy, brown/khaki, black, gray; shells and camisoles in neutral colors; cardigans in neutral colors). So that’s more or less my daily uniform: pants, shell/cami, cardigan. I’ll throw in a statement piece maybe once a week. A cool sweater vest, printed dress, interesting jacket. Accessories can also make an outfit look new and different. I honestly don’t think about it enough to be able to name what I wore when. I generally don’t wear anything more than once a week, I also don’t wear the same thing on the same days all the time (I had a coworker who wore a suit every M-Th and then the same polka dot skirt with a black top every single Friday, which was a bit odd). Other than that, I don’t worry about repeating. Maybe I should, but it never occured to me. I have a bright color suiting dress from J Crew, for instance, that I may wear once a week or at least once every other week in colder months, but it doesn’t really strike me as odd to do so, esp. since I typically switch up accessories/shoes. I do think that anything neutral colored is easier to wear more frequently, but as long as I pair different things together and they’re clean, pressed, and flattering, I don’t really overthink it. In terms of things that are really memorable, like a patterned dress, I don’t wear them week to week, more like once every month or three, but that’s more because these items are likely already pushing the boundaries of what is appropriate for my office and so opportunities to wear them are rare. I am basically a pants-blouse-cardigan-flats person, and I will re-wear the same (patterned) blouses every week or so. If this makes people “wonder,” then sorry they have so little to think about. I also think it’s nuts that people keep track of what they’ve worn when. My hubby just mentioned I’ve worn the same casual Friday shirt/dark denim combo for the past month, maybe the polka dots were your co-worker’s way of celebrating the end of the week? Which leads to another topic – what about repeating casual Friday looks? Again, I think people pay even less attention to this, unless you’re wearing something too casual or inappropriate. like most of you, i have a pretty standard style – usually trousers/blazer/tshirt or blouse. i might wear, say, my black blazer or grey slacks more than once a week, but never the same combination of things. this did make me realize that i have no idea how often i repeat exact outfits – though i definitely do repeat them in general. I have to say that I am an overbuyer, very unlikely to repeat clothes and conscious of this as a perceived issue. But reading this, I’m now examining WHY this is an issue. If a co-worker has 5 appropriate outfits, why is it wrong for her (or him) to wear those five once a week for the season, or even the year, unless they become worn in some way. I think the problem with a dated suit once a week is that it is dated, not that it is being worn once a week. There is something very attractive to me about having a perfect Monday outfit, a perfect Tuesday outfit, etc., as long as it is not actually because I have some kind of disorder that forces me to wear that outfit on that day. Think of what I could be doing with all the time I’d save. I think I’ve seen my boss wear maybe 10 outfits, ever. Is she super fashionable? No, but she always looks appropriate and put together. I couldn’t be that much of a minimalist, but I envy it, in a way. Look how much time she saves by not shopping all the time and worrying about how things ‘go’ together. Her stuff just does. I think of it as a scientific, rather than artistic, way to dress. That approach very much fits with her personality, which is very no-nonsense. I think you could strike a balance. I’m kind of a minimalist in that I don’t own a lot of clothing, but with the exception of a few basics, I consider everything in my wardrobe “fun” and I really love every piece. Sure there are repeats, but I still like to think I look fashionable. Some of my combinations are a little quirky (grey tweed skirt with grey leopard print sweater!!) but quirky is kind of my style anyway. I know what I have, it all fits in my medium-sized closet, and dressing and packing are super easy. I just mindlessly ate an entire bag of Poppycock Pecan Popcorn. Thats 900 calories in one day, exclusive of meals (which have been small, which is probably how I ended up in this position). No more snack food at my desk!!! I cannot keep snack food at my desk for this reason. I will (and have) work my way through a box of granola bars or a bag of nuts in one day. I have to just bring the food I want to eat. If I bring more, I will eat more. I think its boredom more than anything else, because I don’t overeat at home, even though food is readily available. Something about sitting at my desk causes me to plow through whatever I have. I have this problem too. I’ve started keeping a log where I write down what I eat, and it has helped curb my mindless eating because I don’t want to write down a snack that I ate when I wasn’t hungry. Might be worth a try. I’ve also noticed that I like to chew on things when I’m stressed, which unfortunately is all the time these days, so I just bought a shameful amount of gum at Costco. I am a young professional just starting out, and I have 5 suits and wear each once a week. This thread saddened me because the budget still does not allow for another 5 yet (and my work place requires suits). I’m guessing that I’m not the only one who can afford to mix and match so much because I don’t wear suits. A non-suiting outfit is MUCH less expensive. I would rotate jewelry and tops (and shows if dress code allowed any fun in that category) like crazy, but I would not buy 10 suits. Trust me, suits are not noticeable and can be worn interchangeably without anyone noticing (unless your suit is, say, daffadil yellow). For my coworkers who wear suits, 90% of the time I couldn’t tell you if their suit is new/old, same as the day before, whatever. As long as its neutral and fits, no one is likely to remember it. @Anon: Don’t be sad! That’s more than enough, especially if you have more than 5 shirts to go with it. Suits blend together and I very much doubt anyone has ever noticed the number of suits you have. Fwiw I work in a biz-casual environment but wear suits at least once a week for internal and external meetings, as do my co-workers. I have no idea if any of their suits are repeated or how many each of us has. I’m pretty sure I have about 5-7 “full suits” but if you can buy at least 1 or 2 of them with their other pieces (skirt/dress/pants, not just the pants or just the skirt), it’s like getting 2 suits instead of just the 1. When I was interning at court, this got me through the summer… of course, a cointern and I owned the same suit so sometimes we were suit twins. This! The skirt-pant-jacket suit (the “lady-3-piece” my husband calls it) is a great purchase. You can definitely wear a suit multiple times during the week if its neutral. All [most] people will remember is that you were wearing a dark suit. Just make sure to hang up both pieces of your suit as soon as you get home at night. You may also want to get a steamer to help freshen them up and take out lingering wrinkles in the morning. You could wear the same basic suit every day and nobody would care or notice (or if they do, who cares, they should realize you have other things to spend money/time on, and they should buy your drinks at happy hour too), especially if it has skirt and pants options. Five different colored tops and a scarf or two for variety, just don’t wear the same color on the same day of the week each week. The end. I try to mix and match so I’m not wearing the exact same outfit too often but sometimes I just love certain combinations and try to space them at least 2 weeks apart. It’s often not super memorable but just a combo that makes me feel super put together or something like that. This makes me feel so much better. I was feeling like I have “SO MANY CLOTHES” excessive, how are you still shopping! But for winter, I basically wear each item once a week. I definitely mix them up, but pretty much all of my sweaters, jackets, and work pants are worn every week. Then I wear one of 3 suits one day (with one of the sweaters) and jeans one day (with the sweaters and a blazer). Maybe I wear each jacket 3 times a month instead of 4 especially when I rotate a cardigan in? I can totally shop more! Hurray! I don’t repeat tops more than once a week, but pants, skirts, cardigans, jackets… sure! If it’s gray or black and nondescript (like most of my clothing in the aforementioned categories) I might even wear it two days in a row. My rotation is mostly governed by how often I do laundry. Once it’s clean, it’s pretty much fair game in my eyes, regardless of when I last wore it. I think for the most part as long as your clothes aren’t smelly, wrinkled, or loose from too many wears, you’re good to go. I should add that my work wardrobe contains limited items that I like and fit properly, so I tend to wear those items more often and consider my poorly fitting, not favorite items to be my backups for when I’m behind on laundry. I’m not a big fan of work clothes in general (don’t like how work pants fit me but usually can’t wear skirts/dresses due to work environment) so I’d rather repeat the clothes I feel good wearing. I’m an auditor for a public accounting firm, so it’s fairly easy for me to repeat outfits within the same month. I usually do not work in my office, so my co-workers don’t see me every day. I spend the majority of my workdays at client locations, so in a given week I could visit up to three different clients. I’m usually working with different co-workers on each engagement, so that helps. Since I’m rarely in the same place for more than a week or two, I don’t have to be too concerned with repeating outfits. The only time I really have to think about it is when I’m on a long, six week engagement where I am seeing the same people every day. This is where using the floor as additional clothing storage comes in handy. At the end of the day, my pants or skirt get hung up in the closet but shirts and sweaters go in the laundry or on the floor. Shirts that are machine washable or otherwise have to be washed at every wear go straight to the laundry basket while sweaters get dumped in a pile on the floor. This way, I can never wear the same top twice in one weekbecause all the stuff I’ve worn that week is “dirty” (exceptions made for cardigans sometimes). On the weekends, I typically fold all the sweaters on the floor and put them back in my dresser. Anything that doesn’t pass the sniff test goes in the laundry basket instead to get washed. Pants and skirts are generally neutral and can get worn multiple times per week depending on which pair goes with that day’s top. I own about 4 pairs of winter weather pants and a handful of skirts (don’t wear skirts much in the winter though) so the pants definitely get repeated a lot. It gets a little more complicated in the summer because I wear a lot of dresses that I do hang up at the end of they day, but even then several of them don’t pass the sniff test and go into the laundry. I would say I generally don’t wear outfits (same top or same dress) more than once every two weeks, but sometimes a dress I wore one Monday will show up the following Thursday or something. I had never really thought about mixing up accessories. I generally have the mentality that certain accessories go with certain outfits, so that’s what I wear every time I wear that outfit. Excellent food for thought! How do men do this? Do they just own like 4 pairs of pants and 8-10 dress shirts that all go to the cleaners every 2 weeks? And then a pile of ties to rotate? This reminds me of the water bottle post. Same. So much pressure for young women. Hang in there, ladies! Once you reach 35 or so other people’s opinions do not carry as much weight. Unless they’re signing your paycheck, that is. Reached it on Monday! And glad to hear that I now have official permission to tell people to #[email protected] themselves ;). I thought the same thing. Honestly, I may need to take a break from this site and fashion sites in general. While I needed some help in getting my style and wardrobe up to snuff, I’m tired of feeling like no matter how hard I try, it will never be good enough. There’s always something new to get fixated on. Me too. I just can’t muster enough energy to care about repeating things (yes, I wear almost all neutrals / basics and don’t repeat memorable / colorful things often), much less jewelry/scarves/shoes…all my shoes are black/neutral. I have 6-7 pieces of really nice jewelry that I rotate. I try to get at least 2 wears out of slacks / skirts before they go back in for dry cleaning. I utterly fail in the fashion department. I do not keep track of how often I repeat, but I do repeat things like black pants more than once per week. If I’m wearing a totally different shirt or sweater or jacket, I don’t think anyone’s going to notice that I’m wearing the same pair of very basic pants again. I probably only wear dresses once a week or so, so I repeat them less often, maybe once every two weeks, and even less often than that if they are particularly distinctive. Overall, I would guess that don’t repeat the exact same combination more than once every 2 weeks or so. Again, though, that’s just my sense, and I do laundry constantly (I hate seeing a full hamper), so I could see myself repeating more often than I realize. I did a HUGE closet purge in the fall and actually found it to be refreshing. Google capsule wardrobe or Project 333. I somewhat keep track of what I wear and try not to do the exact same outfit more than once in a two week period, but my winter wardrobe, save for a few dresses, is pretty boring and looks a lot a like anyway (I haven’t bought the last few sweaters I’ve liked because they look so similar to things I already have!). But, really, I figure if I can’t remember if I wore it in the last week or two, then chances are, none of my co-workers (save maybe my secretary who sees me everyday) will notice or remember, since I don’t see everyone every day and I hardly think they’d notice. I’ve also recently realized that I wear the same basics over and over because I’m over at my SO’s place most nights/mornings and don’t have my complete wardrobe there (he may THINK I do, but little does he know…). I can think of a few winter items I haven’t worn at all because they are hidden in my closet. I hang up everything to “air out” after I wear it in a separate area away from the rest of my clothes. I will leave last week’s plus the current week (so right now I have 1/14-1/18 hanging there plus the stuff I have worn this week) so help my remember/not repeat from week to week. I certainly raid this area if needed (neutral pencil skirts, black pants) but helps me not re-wear the same tops/combos over and over and has actually helped me re-mix clothing in ways I never would have thought to! This is a really fantastic idea! Great idea. Must try this. I wish I could wear the same clothes daily à la Steve Jobs. I don’t want to think about what to wear. Thus, I somewhat envy scrubs-clad medical professionals or anybody else who wears a work uniform. Alas, I will probably never be famous enough to get away with wearing the same clothes all the time. This thread has generally made me happy that I just pull on scrubs every morning. The downside is that the hospital supplied scrubs are unflattering on all female body types. The upsides is that its like wearing pyjamas to work (but respectable pyjamas). And the hospital washes them for me. I have enough pants to go 2 weeks, but in reality I go back to the same 5 pairs pretty much every week. I try to wear a skirt or dress at least one day a week; this week I will have ended up wearing them twice, if I can figure out how to style the new green dress tomorrow. I have two suits, one black & one gray. The black suit I have to be careful about wearing and looking a little to much like an undertaker, but it works great when I need to exude authority. The gray suit says competence without being overly stuffy. I live in separates for the most part, and I save the suits for days when I need the extra push they give. I still dress better than 95% of the people I work with. Starting out working, one might be lucky to have five suits – or office appropriate outfits! Or less! Enought to be “different” at least every day of the work week. By the time I quit working full time in big law, I had enough neutral classic suits and blazers (much more flexibility in mixing and matching, etc.) that I could “repeat” (or partially “repeat”), as you say, probably no more than twice a month – or once a month, but BELIEVE me, I had much bigger things to think and worry about than what anyone at the office thought of my clothes and/or how often I wore what. I certainly never kept track! Why would I? And anyone wondering how often I wore my beloved charcoal gray Armani blazer (over many years,my first firm once told me I set the standard for women in the office (and in court), so obviously I wasn’t seen as poorly or inappropriately dressed. I was under the impression this was a site for working women, no matter what industry. Starting out working, one might be lucky to have five suits – or office appropriate outfits! Or less! Enought to be “different” at least every day of the work week. By the time I quit working full time in big law, I had enough neutral classic suits and blazers (much more flexibility in mixing and matching, etc.) that I could “repeat” (or partially “repeat”), as you say, probably no more than twice a month – or once a month, but BELIEVE me, I had much bigger things to think and worry about than what anyone at the office thought of my clothes and/or how often I wore what. I certainly never kept track! Why would I? And anyone wondering how often I wore my beloved charcoal gray Armani blazer (over many years) should have been paying more attention to work than trivia. But bosses at my first firm once told me I set the standard for women in the office (and in court), so obviously I wasn’t seen as poorly or inappropriately dressed. I’m feeling some angst right now. I know I wear my basic black, brown. gray pants with frequency. Maybe once a week or every week and half. I think I mix up the tops. But to be honest, I can’t really recall my outfits. I’m likely wearing the same combo every week and half or two weeks. Maybe even wearing the same jewelry. Now you’ve got me worried that everyone is noticing and judging me. No, no, you’re fine. My general takeaway is that you can majorly repeat neutrals — I certainly do — and that more distinctive outfits and pieces are what get noticed. I dropped 4 dress sizes last year and while that’s been awesome, I no longer had any professional options that fit. Luckily, I only need to wear business attire maybe once or twice a week. I rotated the hell out of the 1 suit (navy pantsuit), 2 trousers (camel wide leg and cobalt bootcut), 1 skirt (gray tweed), and 1 dress (black) that I had to buy to get through the winter, and belted my older tee shirts and sweaters. There were definitely repeats which I’m sure people noticed, but not enough that anyone mentioned it to me. I didn’t mind for a minute that 1/3 of my available pants were obnoxiously trendy cobalt blue. At first I missed having the options that came from a wardrobe acquired over 7 years as a plus-sized professional, but soon realized I just had way too many clothes before. How many pencil skirts does a woman really need anyway? When I went into the office every day, I was on a 2 week cycle, made up of 5 pairs of the same cut of pants (2 grey, 2 black, 1 tan) and 10 button up shirts (different colors, all the same cut / store (They fit! They flattered! Without tailoring!)). Pants were worn twice unless they were visibly dirty, shirts once. I’d mix them up a bit while making sure that I didn’t go monotone or clashing (grey shirt + grey pants = blah). I think my outfits mostly blended together, which wasn’t a problem; being the only female in the room / working on the project made me easy to remember. I work with someone who wears sheath dresses every day. Always sleeveless, and bright, loud colors. She wears the same sleeveless turquoise sheath dress with pearls in January that she wears in July. It makes me crazy. I don’t want to look at her bare arms every day. And we are a very casual office. Sheath dresses and pearls don’t fit. It makes her look like she is trying to be Queen Elizabeth. You can have 100 dresses but you still look out of place if you do not consider your environment.